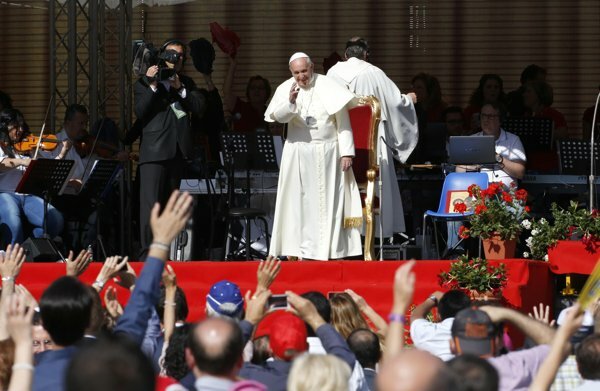 ROME – Pope Francis led a pep rally yesterday in Rome’s Olympic Stadium in front of more than 50,000 Catholics who follow charismatic movements. While listening to what many have termed “the most heinous music ever prayed to,” 50,000 Catholics raised their hands in unison as they prayed for Francis, who silently and repeatedly asked God Almighty to just make it stop. Francis told the faithful that the devil wants to destroy the family, which he described as the “domestic church,” and went on to plead for the end of the use of torture. Francis told the crowd that when he was Buenos Aires Archbishop, at first he didn’t “share” the way the exuberant charismatic Catholics prayed there, but now realized that he still has not changed his mind, going on to encourage everyone to man up and stop crying already. “It was wonderful to see him there,” said Donetta Corti, a charismatic Catholic living in Rome, as she swayed back and forth with one hand in the air like some doped up hippy just moments after taking a hit of that sweet, sweet ganja. “The entire experience appeared to overwhelm His Holiness as it does most every newcomer. Many times you could see him slumped over, vomiting, and asking God to just stop it and to put him out of his misery. It was obvious the man wanted to die a martyr. What humility…to plead to God on your knees in front of 50,000 people to end the misery of the world…to vomit because the pain and suffering in the world touches him at such a deep level. Toward the end of the event, Francis invited members of the charismatic movement to the Vatican for a prayer service, adding that there were many people in the curia and Vatican Bank that he would like to have “sit through this” as a warning to never act out of line again.